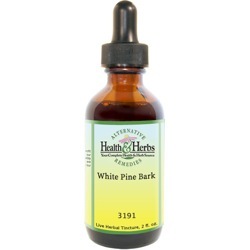 White Pine Bark, an old and trusted remedy for colds and flu. It loosens and expels phlegm from the respiratory tract, easing bronchitis and lung congestion, and the warming qualities can stimulate circulation, which may be helpful in warding off colds and flu before they can settle in. One of nature's most powerful antioxidants, White Pine Bark has been the focus of much attention in the area of combating free radicals and preventing strokes. An excellent expectorant, the inner bark has been a standard herbal remedy for a very long time for treating coughs, whooping cough, croup, bronchitis, laryngitis and chest congestion due to colds. White Pine Bark, as a warming and aromatic stimulant, is said to increase circulation and further help to overcome or prevent the onset of colds and flu by raising circulation of the blood. White Pine Bark is the second highest source of nature's most potent antioxidants, which fight free radical damage in the body. These qualities are helpful in building the immune system and fighting invasive material and other infections. White Pine Bark's OPCs are believed lower the incidence of arteriosclerosis and coronary heart problems, possibly helping to prevent heart attacks and strokes. It is also said to prevent fat in the bloodstream from sticking together and clogging the arteries, which promotes better circulation of blood throughout the body, especially to the heart. White Pine Bark is considered a diuretic that encourages the flow of urine and is thought to be very helpful in cases of urinary tract infections and kidney problems. Ingredients: White Pine Bark, Structured Water, 20% Alcohol. Non-Alcohol: White Pine Bark, Structured Water, Vegetable Glycerin.